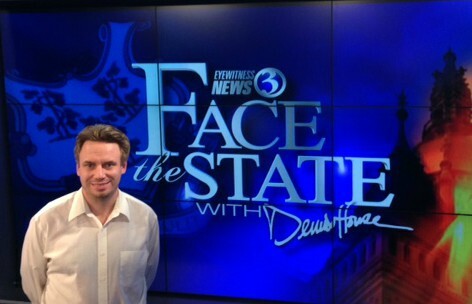 A bittersweet announcement from WFSB: longtime Face the State producer and Eyewitness News assignment editor Chris Collibee is leaving us to work in Governor Malloy’s press office. I’m thrilled for Chris, and sad for us. He has been one of the hardest working members of the Channel 3 team ever since he walked through the doors of the old Broadcast House in Hartford back in 2002. Chris has been a major force behind the scene in so many big stories over the years including trials, murders, election nights, storms, and championships. His love for politics was evident in his work on Face the State. Chris loved researching our guests and helping dig out flashbacks from the archives. Chris was also a friend and a former neighbor. When we both lived near each other downtown, we often walked home together from Constitution Plaza after the 11PM news. Chris’ departure is not a total surprise. After he earned his MBA this past year, I knew a new challenge would come along. I will miss him. Chris is a great get for Governor Malloy, and their energy levels are well, on the same level. By the way, as best as I can remember, the last person to jump from Channel 3 to the governor’s office was Larrye deBear, who left in 1974 to work in the press office for Governor Ella Grasso.